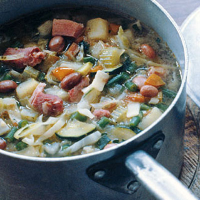 This soup says an awful lot about the food of its French island home. It’s a romantic dish, full of the smoky flavour of mountain ham and the herbs of the maquis, the dense shrub that covers much of the island. Smoked ham hock and gammon are decent substitutes for air-dried, Corsican ham. Heat the oil in a really large pan, add the onion, garlic and leek, and cook gently for 3–4 minutes. Drain the soaked beans and add to the pan with the potatoes, carrots, celery, tomato, rosemary, dried oregano and 2 litres water. Add the ham hock or gammon to the pan and press the pieces down into the soup so they are totally submerged. Bring everything to a simmer and leave to cook, uncovered, for 1 hour. Add the green beans, courgettes, cabbage, tagliatelle and fresh oregano and simmer for a further 15–20 minutes until the soup is thick. If using ham hock, remove the pieces, pull the meat off the bone and tear it into small chunks. Discard the skin and bone and stir the ham back into the soup. Add the parsley and up to 500ml hot water to loosen it slightly. Season with pepper. Serve in large, warmed soup bowls, drizzled with a little more olive oil. The Corker recommends - A classic Portuguese red with the vigour and exuberance to take on the mother of all soups.